“Periods are fun,” said no female ever! While Aunt Flo may be a necessary part of our natural cycle, it doesn’t mean we have to welcome her with open arms. In fact, there are a number of defences you can take to minimize the damage and help your skin survive the major swing in hormones. This is especially helpful if you’re someone who has the unfortunate experience of dealing with hormonal acne. Ready to learn how to prep for your period? Increase your NAC supplement intake. This antioxidant-rich supplement helps to support the liver to rebalance the increase of female hormones being produced during your period. Additionally, folks with acne prone skin have been shown to require more antioxidant support to keep their skin clear. Antioxidants are your new best friends! Increase your Zinc intake. We talk about zinc all the time for acne-prone skin, and right before your period is not the time you’ll want to be skipping your regular dose of zinc. This mineral supplement improves the body’s ability to heal. Any breakouts that do pop-up, hit the road faster and it helps reduce inflammation. It also works as a mild DHT blocker to help with the increase of progesterone hormones. Increase your Probiotic intake. Probiotics help balance excess hormones by way of your gut health. Our intestinal system is a major factor in the “flushing out” of excess estrogen hormones. Probiotics also help to mediate our cortisol levels and reduce inflammation. Now that you’ve got the internal stuff on lock, let’s talk topically! 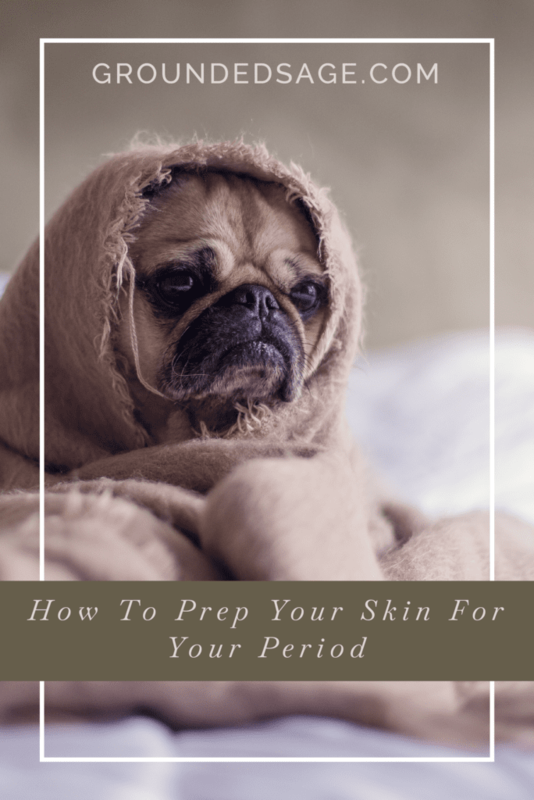 Here’s a list of things you can do externally to help your skin survive your period. Exfoliate every time you cleanse. 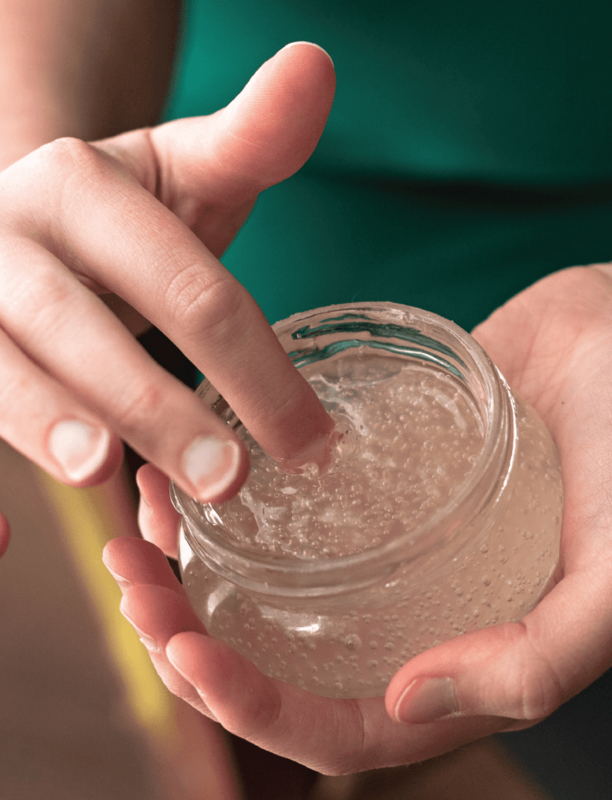 I bet you’re thinking, “WHOA, my skin can’t handle that!” Remember, exfoliation doesn’t have to be abrasive at all! Fruit enzymes can get the job done without any abrasion whatsoever. 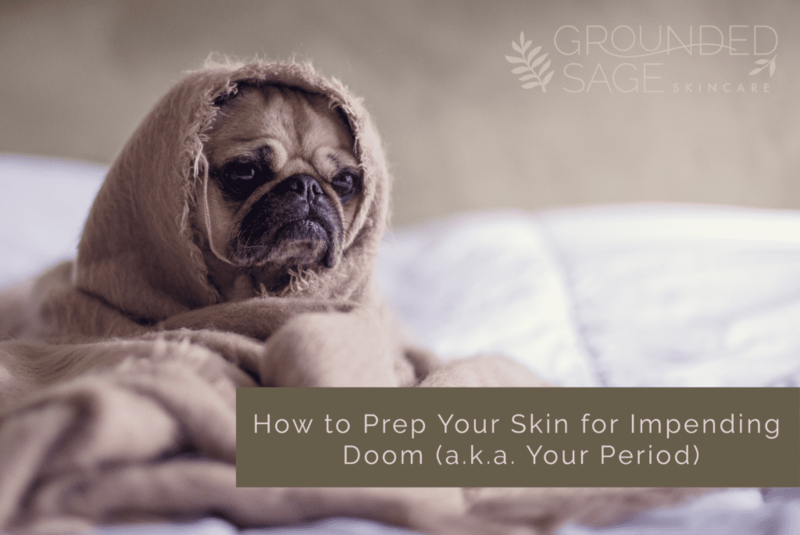 Your skin produces a lot of excess keratin and hormones during your period and during the “ramp up”, which can lead to sticky cells and clogged pores. Here’s our recommended cleansing routine during this time:Morning: Use a cleanser that contains ONLY fruit enzymes. Check out our Pure Amore Gel Facial Cleanser for a good example of this.Evening: Use an exfoliating cleanser that contains both gentle abrasion AND fruit enzymes. Our Pineapple Facial Scrub is the perfect example of this. Don’t skip your morning cleanse. The first tip should have clued you in on this one, but this is ultra important during this time of your cycle because of those sticky cells. Even if you find that your skin is sensitive to cleansing twice a day, this is the one time a month that you’ll want to include it in your routine. Keep it gentle, use a light hand and stay away from hot water (remember heat is one of the most common culprits of “overnight zits” that appear out of nowhere). Increase the amount of Vitamin C & E that you’re giving your skin. These two antioxidants are super healers for your skin during breakouts. They help with collagen products and also provide anti-inflammatory relief. If you’re not already using our Acne & Oil Balancing Facial Mask, this will help you check off both of these from your to-do list. It also contains strong antibacterial ingredients to help with the excess acne bacteria being produce at this time. Include as part of your everyday routine in one of two ways during this time of your cycle.Mask in the shower:Learn how I use this trick HEREAs your hydrator: Apply a light layer under your moisturizer instead of your regular hydrator. Switch to the Patchouli Facial Moisturizer. If hormonal acne is a concern for you at all, you’ll want to switch up your moisturizer to the Patchouli Facial Moisturizer exclusively during this time. It provides antibacterial support but also helps to heal the skin with rich butters and antioxidants. You’re now armed with an entire first-aid kit to help you the next time Aunt shark week makes an appearance. Keep it consistent and we suspect that it won’t be as scary as it usually is… at least for your skin.